Award-winning and much-loved author and illustrator Anna Walker gives us a gentle, poignant, affirming and wise picture book sure to delight all ages. Mr. Huff is a story about the clouds and the sunshine in each of our lives. Stunning as always, and for those of us that love end papers, these are great. Each showing a street scene, the same scene but slight differences from front to back. Bill wakes up to a gloomy day, where nothing goes quite right. 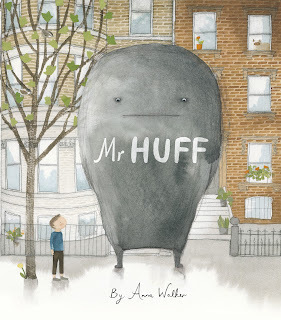 Things don’t get much better throughout the day, and his unhappy/sad/grumpy/angry feelings start to take over and the grey cloud that follows him around (Mr Huff) gets bigger and bigger. It might sound weird, but I like books that show being unhappy/sad/grumpy/angry is part of life. Obviously I don’t WANT children to be unhappy, but it’s a fact of life that we have good days, and not so good days. So a book that shows how you can deal with those bad days and get back to happy, is a good one.